You are here: HomeBlogWhere Does Mold Hide? There are common hiding spots for mold and our NJ mold inspectors know where to look! The question is, however, if mold is hidden, how do you know that you need a mold inspection? There are several telling signs that your home may have a mold issue. When these signs appear get in touch with Certified Mold Testing Service to ensure that you hire a mold testing company with the expertise you need to find hidden mold! Mold loves to hide. It often thrives in dark and damp spots that are not disturbed very often. Because of mold’s preferred conditions, these spots are usually low (or no) traffic areas. So, it makes sense that mold can be a major problem that cannot be seen without a trained eye. After all, if wetness is present to a home owner’s eyes (s)he is going to take care of it. If water is pooling in unnoticed places, the dampness will pervade and it is this dampness where mold thrives. Mold hides under flooring, inside walls, under cabinets, and in fabrics. Sometimes hiding places where mold is festering are easy to find, other times not so much. If you smell a mustiness in the air and can’t quite find where it is coming from it may be from mold. Think about potential damp places in your home. This could be in a crawl space or it could even be from placing moist dishes in the cabinet. If you have concerns or signs that mold may be present, thinking about where you may have had a leak or pooling water is a great place to start. 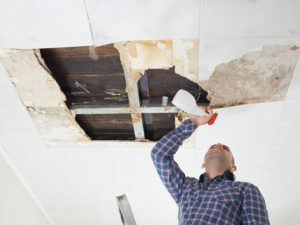 Common hiding spots for mold include the gasket on the front of a washing machine, the drip pan underneath the refrigerator, and the chimney, where dirt, debris, and rain falls. The HVAC system is another environment that tends to pool moisture and provide a great breeding ground for mold. Of course, another great place for mold to hide is in the air inside your home. Mold breeds in the air, with invisible mold spores that are born, going unnoticed until they decide to take root in the closest damp spot. Bergen County NJ mold testing services completed by Certified Mold Testing Services will check for mold in hard to find spots as well as in the air. Mold testing reveals whether mold is hiding in your home. After mold is discovered you will need to hire a company to remediate the mold. After the mold has been removed from your home it is important to have testing again, to ensure the job is complete. Remediation is not always 100% successful! Read our post about the importance of testing before remediation here. Contact our team at Certified Mold Testing today to schedule mold testing for your NJ home. Our expert testers will make sure that if mold is hiding in your home we will find it. We know the most common hiding spots for mold and many that are not so common. Let our expertise work to make sure your home is healthy! Click here to read “11 Unexpected Places Mold May Be Hiding in Your Home” from Health.com.